4:49 The Golden Echo Warner Bros.
Groovy! I like it, already an improvement on "90s Music". While I did like it initially, I found myself a bit disappointed as it sounded a little lifeless and lacking in energy, especially in comparison to other recent similar sounding tracks. As expected though it has grown on me and I don't have much of a problem in that regard anymore. More up my ally than "90s Music" and while I did enjoy that I do prefer this. A fun track with a great sound. My favourite of the few songs I've heard from Kimbra that aren't "Somebody That I Used To Know".<br><br>Edit: Can't believe I ever thought this was lifeless, complete opposite of what I think now. Such a fun and enjoyable song which I like even more now. 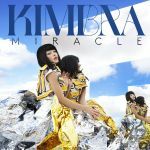 Brilliantly produced and a brilliant vocal effort from Kimbra. So catchy too! Easily my favourite song from Kimbra. Was very hesitant at first because Kimbra is always just full of unexpected surprises. This is lovely though, I think I'm really enjoying her happy songs. Best track from The Golden Echo! It has such a funky beat!